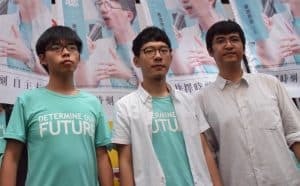 Joshua Wong, Alex Chow, and Nathan Law are three prominent student activists who played a leading role in the 2014 Occupy Central Movement in Hong Kong. All three were imprisoned in August 2017 on charges, initially leveled in 2015, of “unlawful assembly” or “incitement to take part in assembly” stemming from their roles in the protest at Hong Kong Civic Square in September 2014. As of November 7, 2017, all three have been released on bail and are waiting for their appeals trial. In addition, on October 13, 2017, Wong pleaded guilty to charges of criminal contempt of court for failing to comply with an order to vacate the streets of the Mong Kok commercial district in November 2014. Joshua Wong, Alex Chow, and Nathan Law are prominent youth activists who, in 2014, emerged as key leaders in the pro-democracy Occupy Central Movement in Hong Kong. The Occupy Central Movement, better known as the “Umbrella Protests,” was a city-wide civil disobedience movement in which tens of thousands of Hong Kongers took to the streets for months. Joshua Wong is the founder of the political party Demosistō, while Nathan Law is a former congressman (who was controversially removed from his post mere months after being elected) and Alex Chow is the former secretary general of the Hong Kong Federation of Students who is due to begin his doctoral studies at the University of California, Berkeley. In September 2014, the three activists were involved in the storming of Civic Square, a fenced-off square located outside government buildings in Hong Kong. The storming of Civic Square was a response to reforms imposed by Beijing authorities that limited the pool of candidates considered for the position of chief executive, Hong Kong’s top leader. The protest is considered by many to be one of the catalyzing events for the Umbrella Movement. As leaders of the Occupy Central movement, the three have faced legal punishment for exercising their rights to freedom of assembly and of expression. Human rights groups and other observers—including PEN America—have expressed their concern that these charges are politicized attempts to crack down on dissenting political expression in Hong Kong. April 3, 2019: Joshua Wong appeals his contempt of court charges. The court postpones judgment on the case, allowing Wong out on bail in the meantime after serving six days of his original three-month sentence. July 4, 2018: A Hong Kong court rules against democracy activist Wong. The judge sides with the police officer’s claim that despite not putting Wong under arrest, the officer believed there was a “real need” for police officers to handcuff Wong at the protest. Deputy Adjudicator Simon Ho dismisses Wong’s claim and orders him to pay HK$8,062 in legal fees. Wong says he will appeal his case to a higher court. June 7, 2018: Wong sues the Commissioner of Police for assault and false imprisonment due to the police officer handcuffing Wong prior to placing him under arrest. Wong seeks compensation of HK $45,000. February 6, 2018: Joshua Wong, Alex Chow, and Nathan Law win their appeal, and the charges and jail sentence are dropped; however, the future sentencing guidelines for illegal protests have been harsher, which may include jail sentences. In another Umbrella Movement-related court case, Wong is granted bail. After failing to comply with an injunction to clear a Mong Kok protest site, Wong was charged with contempt of court and was sentenced to three months behind bars. November 7, 2017: The Hong Kong Court of Appeal grants Alex Chow bail, and schedules the three’s appeal hearing for January 16, 2018. October 23, 2017: Joshua Wong and Nathan Law are released on bail. October 13, 2017: Joshua Wong is found guilty on charges of contempt of court. September 2017: Alex Chow, Nathan Law, and Joshua Wong all file applications seeking to appeal their jail sentences. July 14, 2017: Nathan Law is disqualified from his seat, alongside several other pro-democracy lawmakers, over allegations that they incorrectly took the oath of office. July 6, 2017: Joshua Wong pleads guilty to charges of contempt of court. October 2016: The Court of Appeal agrees to hear a government appeal against the original sentence. September 2016: The Hong Kong Department of Justice requests a review of the sentences. The magistrate rules that the original sentencing and reasoning was sufficient. In the September elections, Nathan Law is elected as a member of the Hong Kong Legislative Council, becoming the youngest elected candidate in history. August 2016: Wong and Law are sentenced to community service, Chow receives a suspended sentence. July 2016: Chow, Wong, and Law are found guilty. April 2016: Joshua Wong, alongside 19 others, is summoned on charges of contempt of court for obstructing the execution of the court’s order for clearance of the central commercial area in Mong Kok. September–December 2014: Occupy Central is launched and protests continue into early December. September 27, 2014: Protesters first assemble at Civic Square. The convictions of Wong, Law, and Chow have occurred against a backdrop of diminishing civic freedoms for Hong Kong. PEN America has documented the shrinking space for media diversity in the territory, and the 2016 kidnappings of five booksellers by security officials from the Chinese mainland. In November 2016, PEN America sent a publisher’s delegation to Hong Kong to present and discuss the findings of the report on the kidnapping of the booksellers; in this time, they met with Nathan Law and other legislators and free expression advocates. Joshua Wong in particular is a high-profile activist and has been subject to several formal and informal restrictions on his freedom of expression. In October 2016, Wong accepted an invitation to travel to Thailand to speak about his experience of the Umbrella Movement at an event hosted by Chulalongkorn University. Wong was detained upon arrival, and after 12 hours was deported to Hong Kong. Wong claimed that the authorities would say no more than that he had been blacklisted. In addition, in July 2017, PEN Hong Kong (the Hong Kong chapter of PEN International) was refused the opportunity to launch a literary anthology at the Asia Society Hong Kong due to their proposed inclusion of Joshua Wong as a speaker.